Green Advantage® is a national certification program for green building practitioners. It is the only certification for green builders and remodelers that is both national and unaffiliated with a trade association. Established with grant funding from the United States Environmental Protection Agency and the Nature Conservancy, Green Advantage was developed in collaboration with Science Applications International Corporation (SAIC) and the University of Florida. Green Advantage® certification is intended primarily for individuals working within the construction industry, such as contractors, subcontractors, and trades people. In order to become certified, builders, and other industry professionals often opt to take a training course prior to taking the Green Advantage® exam. 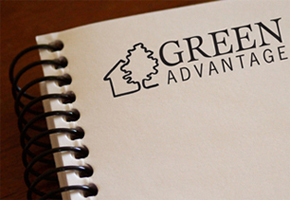 David Johnston of What’s Working is an authorized provider of the Green Advantage® residential training. He is personally training other certified professionals nationwide to provide this course. His course, Green from the Ground Up, prepares students to take the Green Advantage® exam. Over 3000 building-related practitioners have taken the Green Advantage® certification exam. Professionals earning the certification can market themselves as such and also become part of the database of Green Advantage certified practitioners. Homeowners through greenbuilding.com and affiliated marketing organizations may search this database for a certified practitioner in their area. Your membership in this database will help separate you from your competitors in the field. There will also be a community on greenbuilding.com for certified practitioners that provides the opportunity to network with each other and to problem-solve with peers while providing special up-to-the-moment content to keep you current in the rapidly changing field of green building. How does Green Advantage® Certification relate to LEED® Accreditation? According to the USGBC, “LEED® Professional Accreditation distinguishes individuals with detailed knowledge of LEED® project certification requirements and processes and a command of integrated design principles. LEED® accreditation is awarded to building industry practitioners who successfully demonstrate these proficiencies on a comprehensive exam.” The USGBC encourages its members to become LEED-Accredited. Like the USGBC, Green Advantage® provides a third-party, independent certification for the building industry. However, LEED focuses on certifying buildings and the people who assess those buildings while Green Advantage certifies the builders themselves. As a result, Green Advantage certification complements that provided by the USGBC. Though Green Advantage® is not affiliated with any LEED products or trainings, LEED projects can get a LEED innovation credit for using Green Advantage certified practitioners. Professionals interested in LEED accreditation or training should look for classes that are specifically sanctioned by the USGBC for that purpose. To get Green Advantage® certification individuals must have a basic knowledge of green construction concepts, materials, and practices in six thematic areas and pass an exam with a score of 75% or higher. The exam includes questions in each of these six areas and includes both field and design-based questions. Exam questions are developed by green building experts, tested by a psychometrician, and approved for use by the Green Advantage® Certification Board. The Certification Exam Fee is $125 if you are taking the exam at a session scheduled as a part of an authorized Green Advantage® training. If you’re a building professional and interested in taking the next steps to becoming a green building professional, contact GreenBuilding.com for more information.